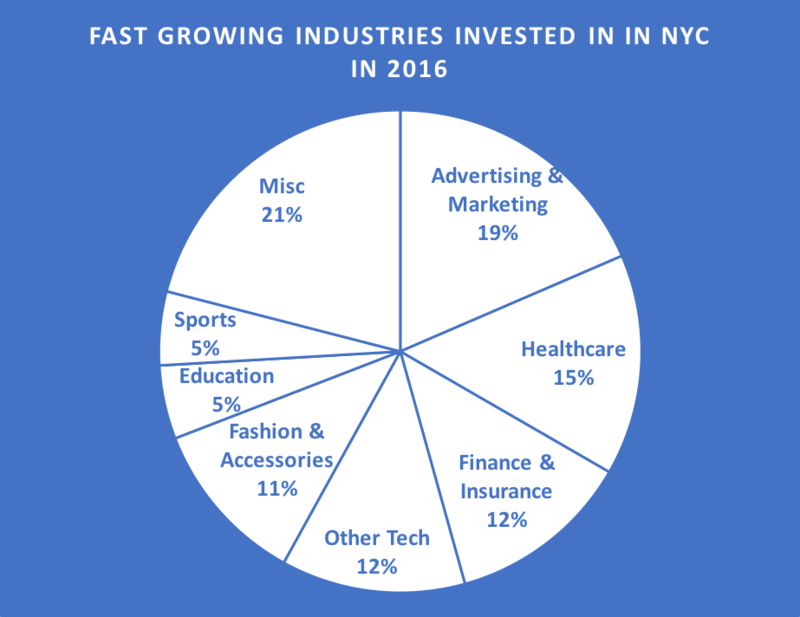 Top 3 Fast Growing VC Backed Industries in NYC in 2016 — Katie B. Between 2006 and 2009 I worked in online media and advertising. At the time it seemed like Advertising & Marketing was one of hottest industries. Then, I took off a couple of years to get an MBA and subsequently changed industries. I had the impression that startups in the Marketing & Advertising industry had hit their maturity and were in decline. What I was experiencing is basically the opposite of the Baader Meinhof phenomenon I guess. Because I was wrong. Advertising & Marketing is still a hot industry. In 2016, fast growing startups in the Advertising & Marketing industry raised over $100 million in equity investment in NYC. This is what I learned when I scraped the web to find out which industries were growing in NY in 2016. What I found surprised me at first but when I took a deeper look it all made sense. How can you tell if an industry is fast growing? By taking a look at each of the companies raising equity and analyze the following three criteria: the amount of the current raise, the total amount of previous raises and the number of years since founding. A typical technology-based company that is backed by investors will first get a small round of funding. This may be called: Angel, Seed or even Series A and is likely to range anywhere from $500 thousand, or less, to $1 to $2 million. If that investment goes well, meaning the company is hitting their milestones for traction and revenue, the team will be able to raise another round. The next round is a growth round, which may be anywhere from $5 to $20 million and meant to enable the startup to really attack the market to prove product market fit. This company is also likely to only have been around for a few years. Meeting these three criteria, we can assume that a company is in growth mode. And all businesses that receive equity investment need to grow fast. So I had a look at all of the New York based companies that raised equity funding in 2016. I analyzed the companies, looking at the industry they are in and the more specific category and saw three industries that stuck out: Advertising & Marketing, Finance & Insurance and Healthcare. These industries make sense for NY. Madison Ave has always been the center of the advertising world. Even if you don’t know anything about the industry, you’ve probably seen Mad Men and know that NYC is the home of the Advertising & Marketing industry. Finance & Insurance was really no surprise. NYC has been the finance capital of the US and maybe even the world for a long time. It just makes sense that there are a lot of people who have worked in the finance and insurance industries who see market problems that they want to solve and go about addressing them. After doing some research, I found that New York is the state with the most people working in the healthcare industries; many universities offer degrees in the medical and healthcare industry, there are a number of large pharmaceutical companies with offices in New York (Pfizer, Bristol Myers Squibb, etc) and there are number of important hospitals. It makes sense that New York’s health care professionals are trying to solve market problems too. For Advertising & Marketing the types of growing startups getting funding are mostly in AdTech and subscription technology businesses. Let’s take these two examples of Advertising & Marketing companies that successfully raised in 2016. Beeswax (awesome domain, btw) is an AdTech company that offers programmatic buying. If you do not know what that is, don’t worry about it. It has to do with the way that advertisers buy ad space in real time to better reach their audience. Beeswax raised $13.2 million in September 2016. This was their second round, after raising a seed round 14 months earlier. Frame.io is a subscription collaboration tool for video creators and compares themselves to a InVision or Github for video. Frame.io raised $11.8 million in September 2016. This was their second round after raising a seed round just 11 months earlier. For the Finance & Insurance industry we are seeing a trend of loans and subscription businesses getting funding. Let’s take these two examples of Finance & Insurance companies that successfully raised in 2016. Credifi is a a big data platform in the Commercial Real Estate finance market and focuses on lending. Credifi raised $10.6 million in September after previously raising two rounds 12 and 24 months prior. Stash is a personal investing app. Stash raised $9 million in August 2016 after raising earlier in the year, and subsequently in December as well. In the Healthcare industry Health & Wellness companies are trending. An example of a Healthcare companies that successfully raised in 2016 is Fruit Street. Fruit Street is licenses telemedicine software to healthcare professionals to conduct video consultations with patients. Fruit Street raised $5.4 million in June 2016 after previously raising multiple earlier stage rounds. Overall, these companies raised close to $300 million. The main trend that we can see is that subscription businesses really are one of the sexiest types of businesses these days. Download full list of NY based companies in the Advertising & Marketing, Finance & Insurance and Healthcare industries that raised between $5 and $20 million in 2016.